Their howls woke me just before daybreak while moonlight and stars still swept the sky. They always begin the same way. One wolf raises her voice to the heavens and the others soon follow in unison, filling the valley with a most beautiful, haunting wolf song. 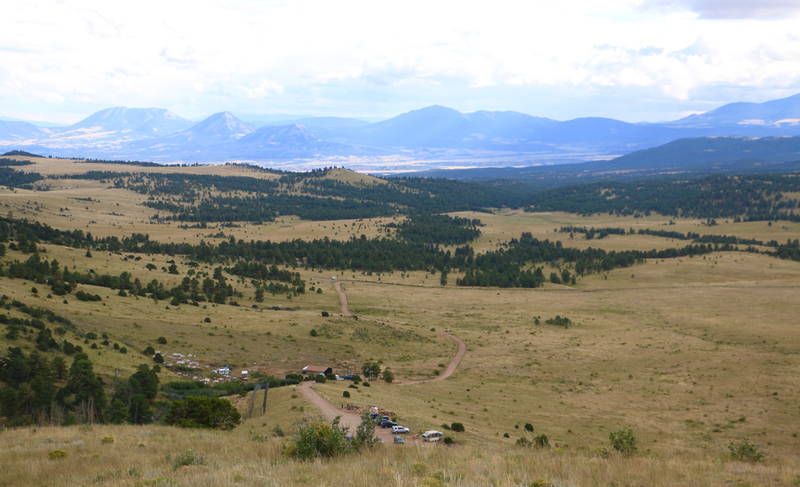 As I laid in the old, borrowed, pop-up camper listening to their soulful howls, something stirred inside, like cosmic dust shifting deep within my bones, calling for remembrance of a wildness lost long ago. 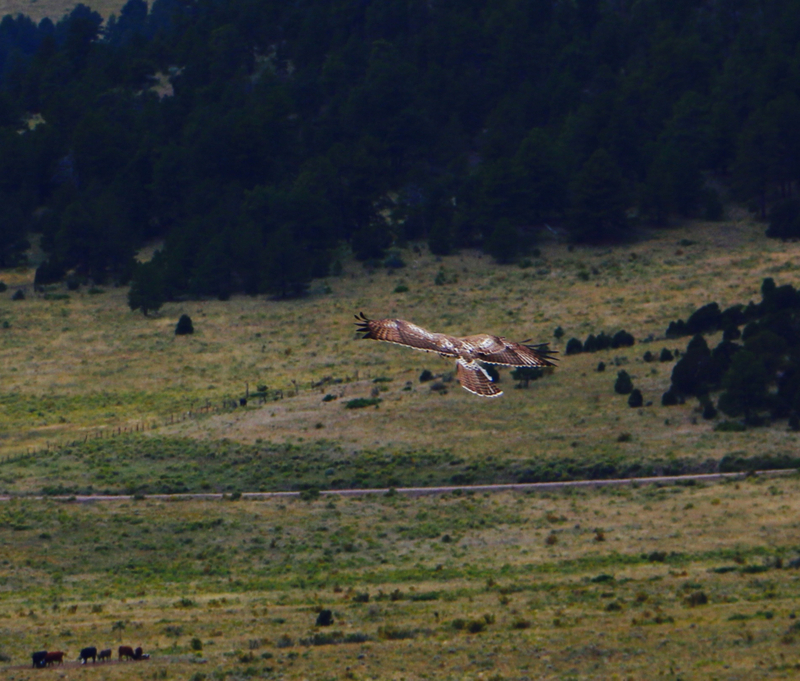 By the time their song quieted and the hush of the valley lifted with first daylight, an intense need lay prominent in the silence, a need for the connection between their ancient, native language and my very own. A wolf’s eyes are piercing and penetrating, colored by a depth that can break through any masks draped by ego and fear. Perhaps this is why the wolves draw so many people to the sanctuary. Perhaps this is why people of all kinds come to stay, work and volunteer at Mission: Wolf for months, even years at a time. The wolf embodies raw, primal wildness and holds no pretense, no lies or falseness like the kind our society so readily provides. 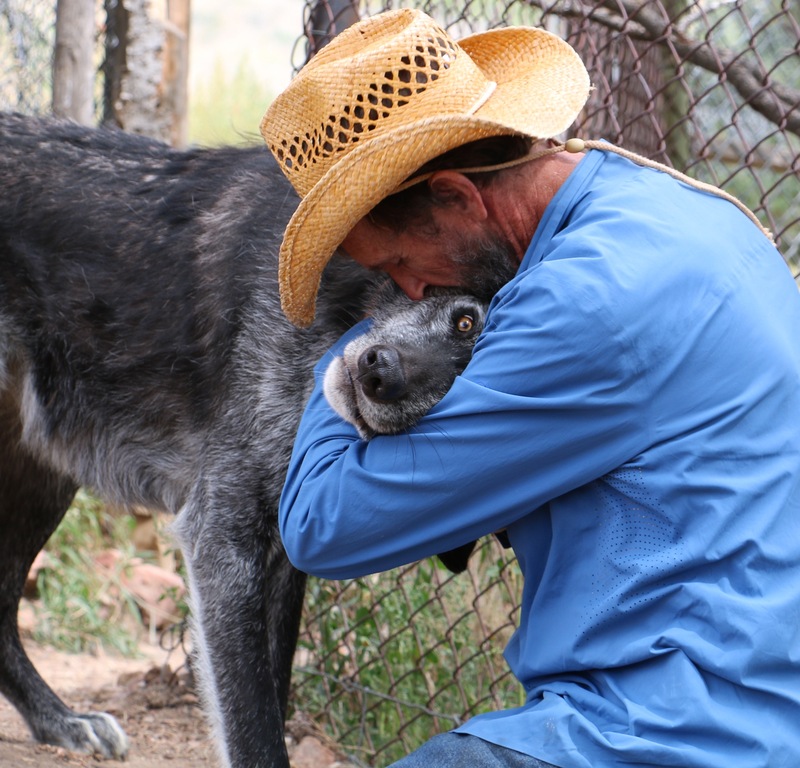 All kinds of people stay at the sanctuary working for the wolves, many of them seeking healing, truth and integrity, bound by an unspoken desire to be seen as they really are–flawed, yet infinitely wild and free. Wolves, in the Native American tradition, are deeply respected as powerful teachers and guides. They are intelligent, social, and free spirited animals, loyal to their lifelong mates and to their strict, pack order. Most Native American cultures would never think of killing a wolf. A wolf is their kindred spirit, a brother and sister. Having watched these beautiful animals play, nuzzle, and greet humans with friendship, it’s hard to think of them as the terrible predator that they’ve been targeted as. What makes me sorrowfully ill is the existence of people and websites that promote the hunting of wolves for sport, claiming them to be the “top predator of the Northern Rockies”. Oh the irony…I say look again sirs. As with most of Earth’s wildness, somehow we have come to believe that if we can tame something, we can possess it, and by possessing it we can do what we want with it. Human affliction is obsession with possession. The pain and repercussions of the lies we tell ourselves is felt by every living thing on this planet. Slowly, the language of our own wildness has been lost, pushed far beyond recognition. The reality of this lies before us every single day. People have been breeding wolf and wolf/dog pups for years, selling them to humans who want to possess them as a pet. The friendly nature of wolf pups can have people fooled. Soon they learn that the independent spirit of a wolf cannot be tamed, contained or owned liked dogs. As the pups grow and mature, problems arise, particularly if genetically they are more wolf than dog. Wolf and hybrid owners eventually lose control of their pets, causing them to be euthanized or shot unless a sanctuary can adopt them. 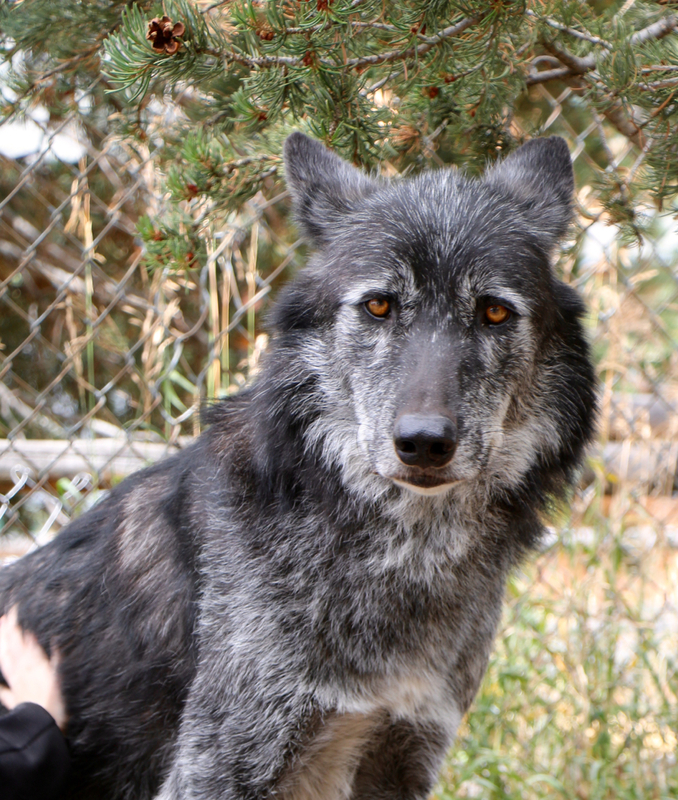 Wolf sanctuaries like Mission: Wolf exist to save these pet wolves and hybrids if they can. More often then not, pet wolves and hybrids are turned away due to lack of space and limited resources. Mission: Wolf, named in reference to the movie title Mission Impossible, has the primary goal to eliminate the need for wolf sanctuaries. People like Kent Weber, the founder, are trying to make amends for human error by making a difference. Healing for our human recklessness in every sense, can begin with just one person–or one animal inspiring us to do the same. On the day I met wolves, I didn’t know I would find myself looking into a mirror. I didn’t know that a wolf could reach into my soul and pull pieces I’ve left un-mended, challenge a truth I’ve left un-attended. I walked away from those wolves wanting deeply to change that truth, and become something entirely different, something already coded inside with a divine, primal right to embody my own bold and wild soul. 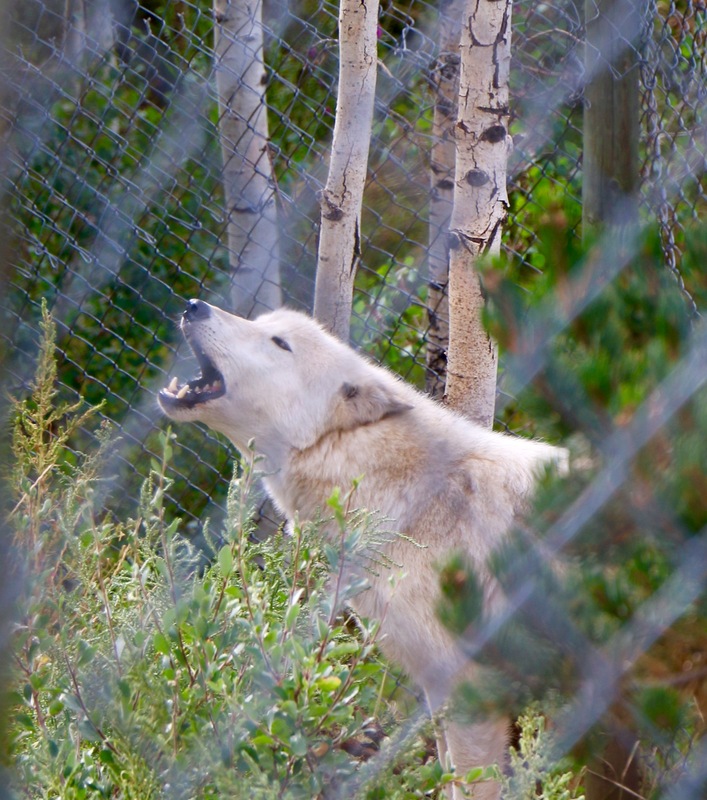 It was the afternoon of our first day when Kent sat us in a circle before entering the Ambassador wolves’ enclosure. 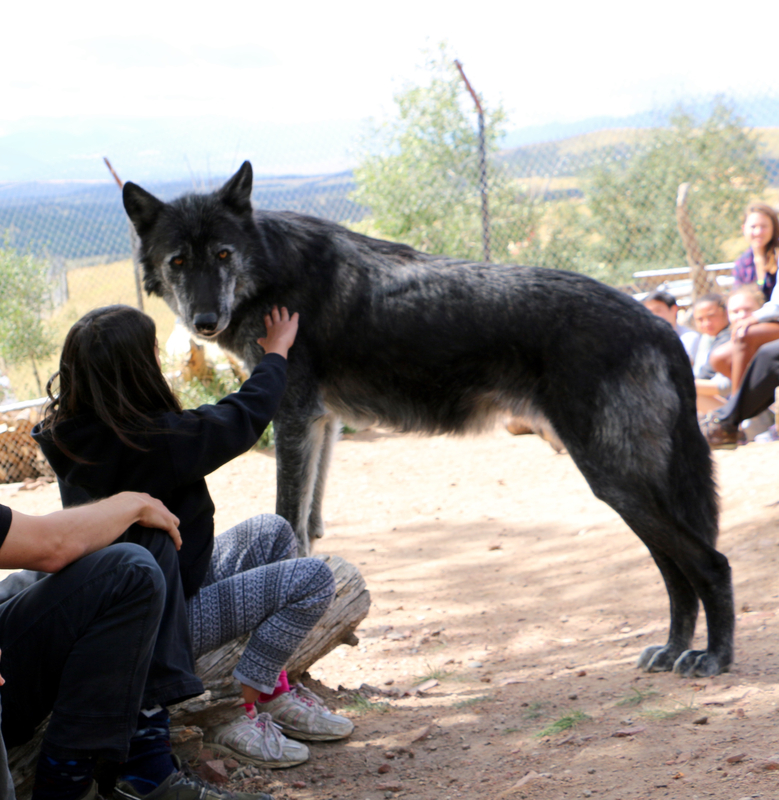 Mission: Wolf trains certain wolves who particularly enjoy human company as Ambassador wolves. Ambassador wolves travel the country educating groups about wolves, allowing people to meet them, touch them, and hopefully understand them better. Currently, there are three, Abraham, Zeab, and Magpie. On this day, we were a group of approximately 15 visitors, some having had the privilege of meeting these wolves before. 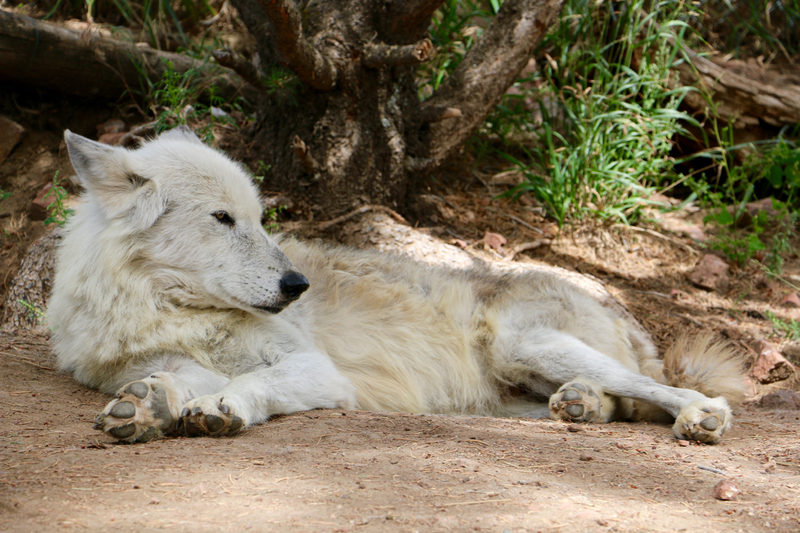 Kent explained that a wolf’s nature is not like a dog’s. Most dogs seek your attention and approval, needs it even, but not a wolf. In a wild setting, wolves are afraid of humans and will hide from them. In a setting like the the sanctuary, where they see and interact with humans regularly, they do not feel any obligation to humans. In daily relationships with humans, wolves will begin to treat them as another wolf, including disciplining them, seeking order and rank just as they do in a pack. Wolves must earn the respect of another wolf in order to be in their family, their pack, and a human is no different. Wolves can sense deep fear, insecurity, instability, just as they can sense strength and confidence. In other words, they know immediately how a person feels about him or herself and will treat them accordingly. If you see your self as less than an alpha, so will they. Kent also let us know that wolves love small children and feel protective of them. They often will approach children first, sniff them, inspect them, even lick them. I don’t find this unusual, younger children have little need for self doubt as their wonderful, wild spirits shine through their skin, still unspoiled by the confines of ego. The wolves see this and are drawn to it. So am I…. Wolves depend fully on a social order that is dynamic all the time. The one they truly need acceptance from is their alpha, their leader. They are drawn to alphas and will look for them in a group of humans such as we were. They greet the young children first, then the alphas, then move down the rank. Kent told us that as we walk in to the enclosure, walk in tall and confident, like we could care less there were wolves among us. He told us to not to appear needy or wanting of their attention because if we do, we will be ignored. In a culture where humans hunger and crave attention, recognition, praise, approval, acceptance and the need to be “chosen” so we can feel our own self worth, it can be difficult to pretend indifference to be chosen by a wolf. What Kent didn’t tell us and what I soon realized, was that pretending was useless. Within minutes of being in that enclosure, acting was utterly unnecessary. The wolves knew, just by walking by, how you felt about yourself. They could sense in an instant if you were trying to be something you were not, or something you weren’t sure you could be. For me, the challenge was just trying to muster authentic, self confidence, it did not come naturally. In that moment, the truth of my insecurities rushed to the surface exposing my weaknesses. I felt naked and I knew, I knew as I walked in grappling with those feelings, a wolf would not find the alpha in me, because I could not find it either. In a culture where our worth is based on what we think we own and possess, our titles, and our degrees, and how we think we are perceived, it is easy to confuse what our true worth is with what we acquired both materially and egotistically. Wolves cut through the bull with one look. They can see right through you and leave you exposed and vulnerable with feelings you thought you had buried, or even worse–could live with without repercussion. And herein lies the lifelong journey to answer the questions that surface in all of us. Is it possible to strip away the burden that keeps us weighed heavy and hollow? Can we find the self acceptance, love and forgiveness needed to be the strong, confident, self-assured alphas we all have the capability of being? What keeps us down? What keeps us afflicted? What keeps us from finding the worthy treasures hidden within? It’s been nearly three months since our trip to Mission: Wolf and I can tell you that in that time I have accepted the challenge of excavating my raw, authentic voice. Daily, I face unforgiving mirrors and embrace my weaknesses before transforming them into strengths. I continue to climb every edge and stand at high noon, inviting failure to be another badge of courage. I am answering the primal call to seek and unearth the alpha. I can tell you that I have faced fearlessly the parts in me that have kept me tethered to ego and fragility, challenging the need for approval from anyone but my own powerful voice. I can tell you there is little use for coincidence when divine energy knows you want to abolish the shackles that binds the wildness hidden within. I am stepping into the skin that has been waiting for me and I am no longer afraid of my purpose. I am raising my voice to the heavens, answering the wolf’s howl with my own undaunted, gritty, and beautifully wild wolf song. 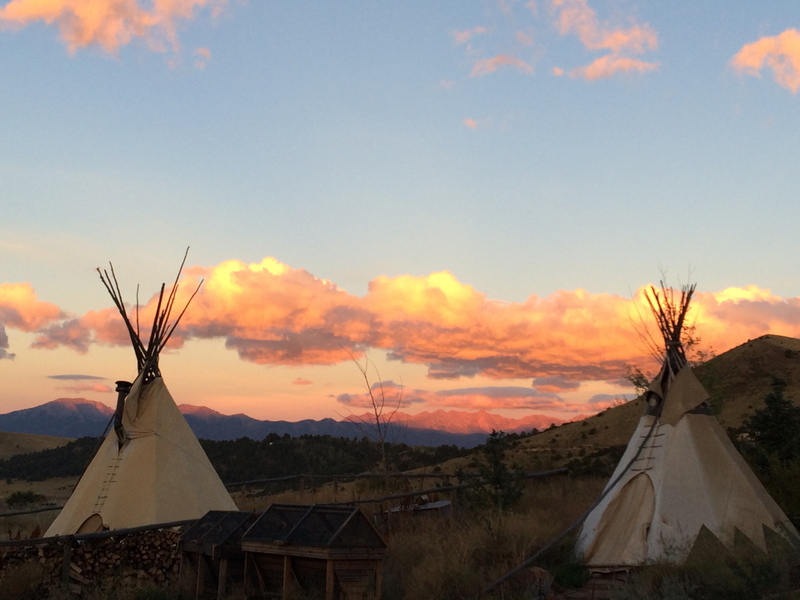 “Healing for our human recklessness” – and how much healing we need! I have always loved animals, for their vulnerabilities and for their purity. No, one cannot hide the true self to an animal. whether it’s a pet dog that growls at one particular relative, or a wild wolf that is dawn towards the alphas. animal know. that was a profound and beautiful experience you were gifted dear soul. thank you for sharing some of it with us. Beautiful beautiful beautiful. They do call to our souls…. Amazing. So good. So true. So beautiful. Beautiful, just beautiful. Thank you for exposing your vulnerabilities here and reminding us all that we CAN do the same.